"You have got to try this new book," my friend told me. "Artisan Bread in Five Minutes a Day and it works!" I put my name on the list for it at the library and waited. And then I heard the authors on The Splendid Table and I started getting antsy. I wanted to try the recipe. I actually wanted to have an excuse to buy yeast -- a product that hasn't graced my shopping cart for many years. Finally, the book got down to my number on the library's list and I rushed out to pick it up (well, as fast as a woman with five children in tow can rush anywhere). I also bought yeast. I mixed up the dough and it actually rose. Even in my house that hovers between freezing and zero Kelvin. Okay, I exaggerate slightly (but we do keep the thermostat at 60 and it is probably only 60 degrees within two feet of the thermostat and some places in the house are a whole lot chillier -- remember this when you start to dream of old houses and all their lovely charm). I put it in the refrigerator, chilled it, did all the steps as indicated and bread actually baked. Then I went wild and crazy. I've been baking and baking and baking. I've made whole wheat, light wheat, naan, pita and more and more bread. Good thing we can eat wheat! It's truly lovely bread. I was very sad when my turn was up and I had to give the book back to the library. But seeing as how I'd used it almost every day for the past three weeks, I decided it was worth the price and ordered it for myself as a very early birthday present. I seem to have finally conquered my fear of yeast. 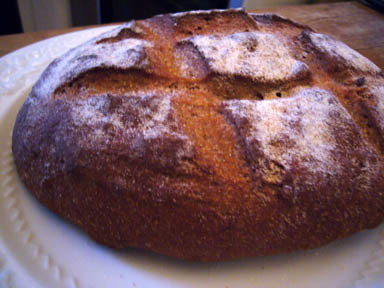 Munu ate my comment, so I'll try again - that bread looks so very good, I can only imagine how good it tastes and smells! The book looks wonderful; I'm really tempted. Naturally, I started a low-carb diet three weeks ago...not sure I could control myself if I started baking bread again! Other than eating it out of hand and as sandwiches, have you tried anything else - breadcrumbs from leftovers, french toast, croutons? Not that a loaf lasts long enough in my house to become any of those things, but I wonder how it would work? Diane, we haven't had any last long enough to try with leftovers, but I think it would be good for many uses. There is a recipe for challah in the cookbook, which I suppose would make excellent French toast, just like any other challah does. I haven't tried it yet though. I love that book too. I am deferring the purchase as I am trying to not eat too much bread (gestational diabetes), but looking forward to getting it after baby arrives. It is actually easy enough to fathom doing with a little baby around too. I've been thinking about buying a bread machine. Maybe I'll try borrowing that book instead... You're SO making me hungry!! Naan? Did you say naan? Mmmmm. 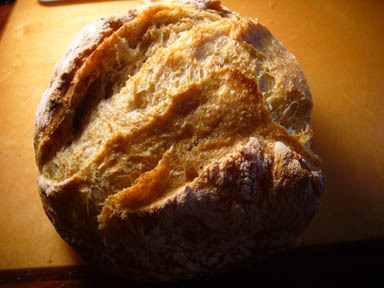 Three cheers for good bread! This looks great. I make lots of "normal"/boring bread but have yet to get over my fear of pita and bagels. Thanks for the inspiration. I actually made passable spinach feta bread- twice!- today. The first loaf was better, though, and was devoured almost instantly by the five of us. Thanks for the tip! Yes, naan! I don't think it is exactly like I can get at a restaurant, but it's a good approximation. Yay, Lenise. That's one of the recipes I want to make, but haven't yet.